When you’re arguing with other people, it’s all too easy to disagree with what you think they are saying. It’s better to base your argument on what they are actually saying. But best of all is to argue with what they think they are saying. 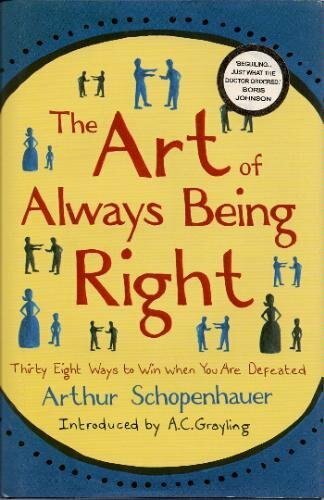 This book is not really about being right. It’s about winning arguments, even when you’re wrong. The 38 tactics include such classics as “Use your opponent’s views”, “Beg the question” and the ultimate: “Become personal, insulting, rude”. You’ll recognise these from many annoying and unsatisfying arguments you’ve had. This book helps you avoid them, and if necessary, use them yourself. Very useful, and all based on “the natural baseness of human nature”. Perhaps it’s best not to dwell on that. Thanks to Wikisource and the wonders of copyright law, you can read The Art of Always Being Right online for free.